A lip & contour sculpting treatment to smooth, redefined and replump the lips & lip area. 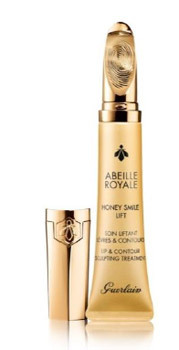 This unique patented** tool developed exclusively for Abeille Royale is an ingenious extension of the hand. Design, ergonomics, materials: everything about this applicator has been carefully considered for application as easy as with a finger. On contact with the lips, the 22-carat finely gilded metal contributes to the refreshing effect. Lips are plumped up from the very first application. On counter at David Jones, Myer, and Sephora.